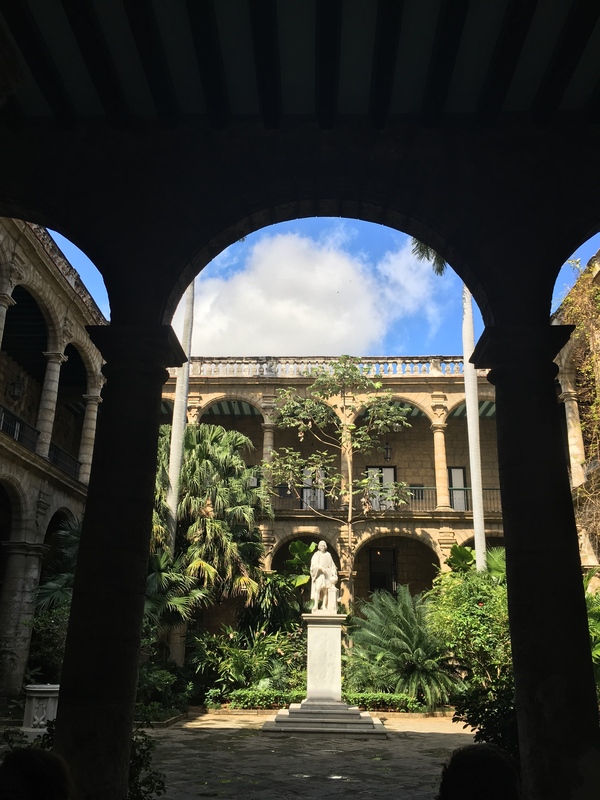 The tour’s focus was Old Havana (La Habana Vieja), which was founded by the Spaniards in the early 1500s as the central stopping point between the Old and New Worlds. Eli Siegel. 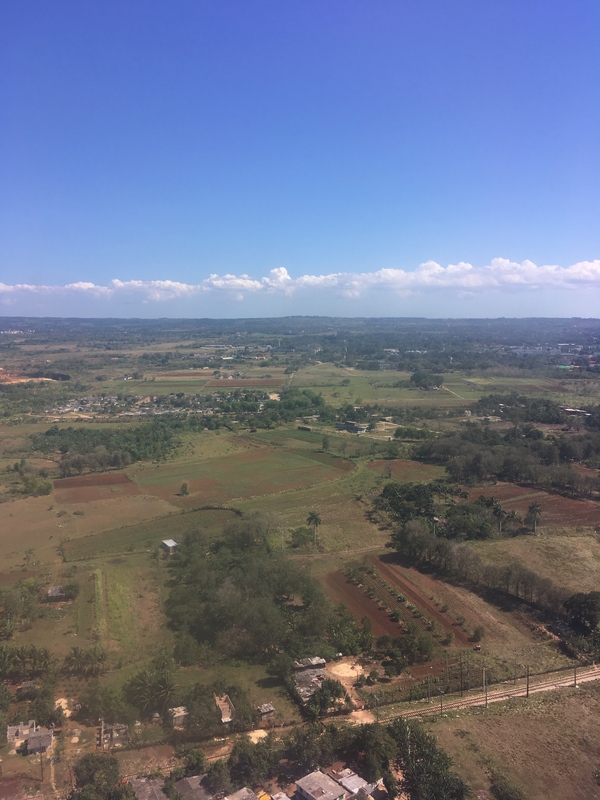 Descending into Havana, Cuba is a beautiful, bucolic delight. Verdant grassy fields and forests extend into the distance as classic, colorful 1950’s American sedans wind through roads enclosing the surrounding landscape. Looking at this sight while staring out the airplane window, I was not sure what to expect for my upcoming trip. Over the last 50 years Cuba has developed isolated from much of the rest of the world. Trade has been restricted, the government controls the economy and until recently Americans were not even permitted to enter the country. Clearly, this would not be a normal travel experience. In order for me to legally go to Cuba as an American, my trip needed to qualify for one of twelve broad categories of admission permitted by the US Government – such as family visits, official business of the U.S. government, journalistic activity (my reason), professional research and professional meetings, educational activities or support for the Cuban people (see the rest of the list here https://cu.usembassy.gov/u-s-citizen-services/local-resources-of-u-s-cit...). If your trip qualifies for one of these 12 broad reasons, the United States grants you permission to go to Cuba without any paperwork. And as far as the Cuban government is concerned with a quick purchase of a visa at the airport before departure for about $15 I was good to go. After passing through immigration and customs, where I simply presented my American passport and the visa I had purchased before my flight, the next step was to get Cuban money. Although relations between the United States and Cuba have improved over the last few years, the US Government still imposes a strict economic embargo and as such any American credit or debit cards do not work in the country. Practically, what this means is you must show up with enough cash to exchange for the duration of your trip. This can easily be done at the airport or at the many Casas de Cambio scattered throughout the city. However, be careful. The Cuban government charges an extra 10% tax if you exchange American dollars for the Cuban Convertible Currency also known as CUC, the currency for foreigners. As such, bring a different currency to exchange such as the Mexican peso or Euro. Other currencies do not get this special tax when converted. Also, keep in mind that there are two currencies in Cuba, the CUC (for foreigners) and the CUP (the Cuban currency). Because the value of a single CUC is matched to the dollar, normal Cubans would not use the currency in their day-to-day activities that are priced much cheaper. Instead, Cubans use CUP, which is about 1/25 of a single CUC. You can still pay with CUC at a cafeteria or shop for Cubans, but as change they will return to you CUP. 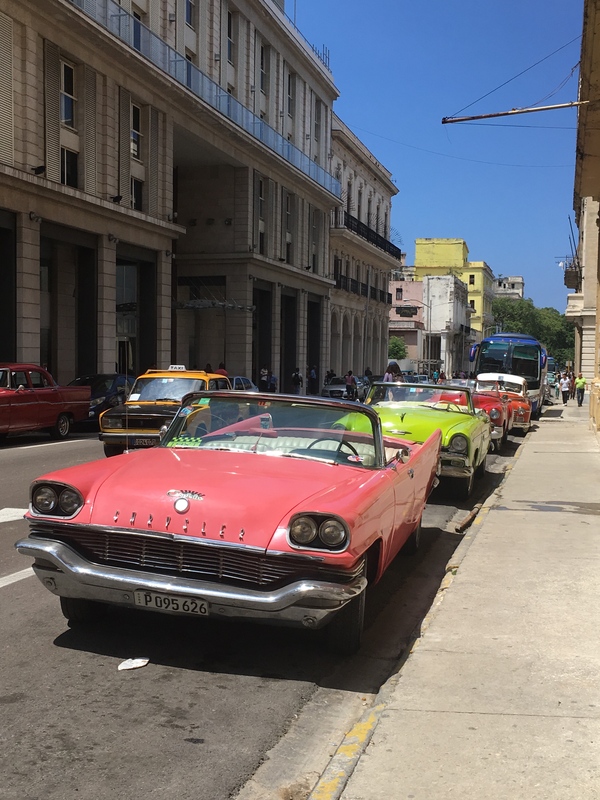 Armed with my Cuban Convertible Pesos, I hopped in a 1952 Buick convertible and raced off to my Airbnb in central Havana, a room in an apartment of a Cuban family of four. I started my visit the next day with a walking tour through Free Walking Tour Havana, which was a great orientation to the city. 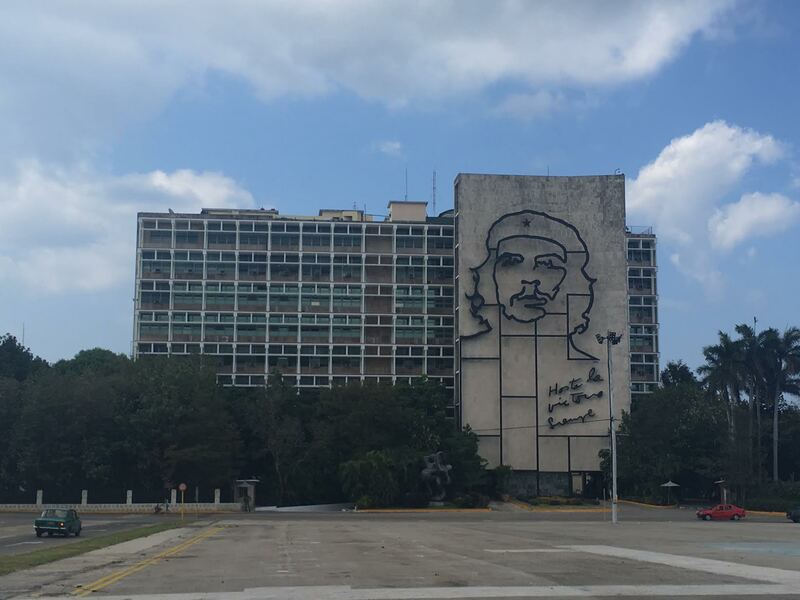 Following our local guide Jaime we started at the picturesque Parque Central, one of the city’s main squares featuring fancy hotels, a monument to national hero Jose Marti, and parking lots filled with 1950s American cars looking to offer you a taxi ride. The tour’s focus was Old Havana (La Habana Vieja), which was founded by the Spaniards in the early 1500s as the central stopping point between the Old and New Worlds. The core of the old town is lined with shops, restaurants and cafes reminiscent of winding European streets. Our first stop was at the leafy Plaza de Armas, which is the main square near the city’s old port. On the western side stands the imposing Governor’s palace built in the Cuban baroque style. Due to the fragility of the local limestone drawn from the sea, sculptors were unable to carve significant detail in their works meaning that Cuban baroque is less ornate than its European counterparts. This emptier baroque is also featured a few blocks away in the façade of Havana’s cathedral, La catedral de San Cristobal. To the northern side of the Plaza de Armas lies the Castillo de la Real Fuerza, which was the original fort for the Spanish army and is considered to be the oldest stone fort in the Americas. Inside, a maritime museum documents the Spaniards’ journey to the New World and highlights the different ships used over the years. Jumping forward a few centuries we continued our tour at La Bodeguita del Medio, a bar famous for being Ernest Hemingway’s favorite place to drink mojitos in the city. In the early 1940s the writer spent several years living in central Havana and was known for his heavy drinking saying “Mi daiquiri en la floridita y mi mojito en la bodeguita” (my daiquiri in the Floridita and my mojito in the Bodequita). The city is not shy about their famous visitor and later that afternoon I took a break at the hotel where Hemingway stayed, Hotel Ambos Mundos, just a block away from the Plaza de Armas. Aside from featuring an eclectic variety of 20th century architecture, the hotel also includes a rooftop bar with fantastic views of the city. Sipping my mojito, I looked out to see the layout of the old town, the nearby fort as well as the coastline leading towards the famous malecón boulevard that runs along the sea. The rooftop bar was also an opportunity to use one of the city’s designated wifi spots. Internet in Cuba is complicated because it is highly regulated by the government. In order to connect to any wifi spot, which can mainly be found in hotel lobbies or designated wifi parks, you first must purchase a wifi card which gives you access for an hour. The cards are available at stores throughout the city for $1.50 CUC or (to save you from the long lines at these stores) can be bought at many hotels for $2 CUC. Walking around the city over the next few days, I continually felt the government presence embedded in the visual landscape. Signs and buildings commemorating the communist victory in 1959 are seen throughout, but this nationalistic homage to the past is perhaps best visualized in the Plaza de la Revolución that features enormous steel wire images of the two revolutionary heros - Che Guevara and Camilo Cienfuegos. Across the street a colossal memorial and statue of Jose Marti reminds visitors of Cuba’s fight for independence from Spain. The government documents this history in detail at the Revolution Museum, which is housed in the gorgeous presidential palace. Descending chronologically from the top floor, the museum showcases the events that lead to and occurred during Fidel Castro’s rise to power in the Cuban Revolution. 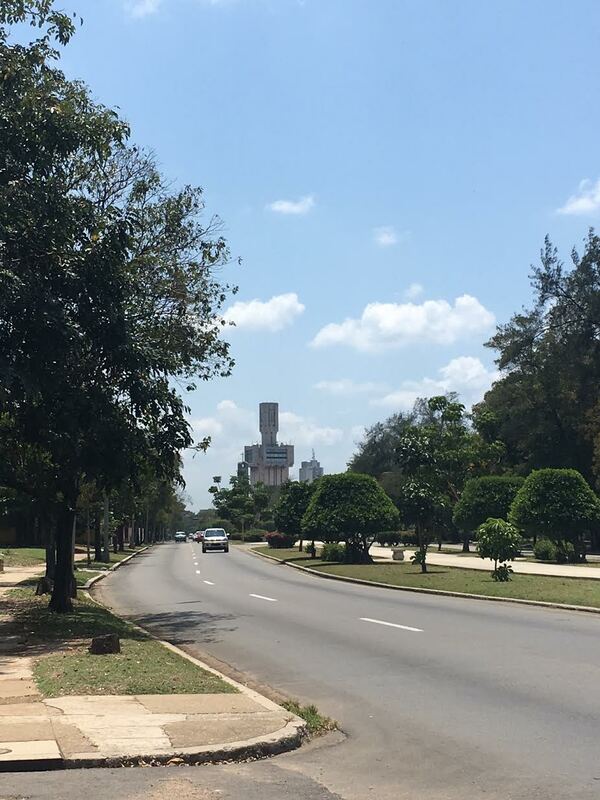 The country’s historic connection to the Soviet Union can be seen in the towering Embassy of Russia, located in the tree lined, upper class neighborhood Miramar. The neighborhood also features the Casa del Habano, an official government cigar shop, where with the guidance of a professional, you can try out the best cigars the country has on offer. For a bit more history, I also visited the Cuban Art Museum that showcases the island’s artistic tradition starting with the arrival of the Spaniards until the present day. The works are divided into four main sections: Colonial Art 1600s-1800s, Art at the turn of the 20th century, Modern Art and Contemporary Art. Before heading out, I spent my final evening at a comedy show at Teatro America. Featuring sketch comedy, dancing and audience participation, the night was a fun affair for people of all ages and is on show most Thursday evenings. Another cultural destination is the Fabrica de Arte, which features art exhibitions and nightly performances with live singers from throughout Latin America. Although the country is changing due to the influx of tourism since the 1990s and an improving relationship with the US, after my time in Havana I still felt as though I had jumped into another world. The classic American cars dominate the streets. Much of the city’s infrastructure is crumbling. There are few ads since everything is government owned and there are things like public ice cream parks (check out Coppelia). If you are looking for an exciting, different destination, a trip to Havana is a must.